Almost since the beginning of our homeschooling journey in 2012, Sarah has been fascinated by space. We’ve investigated it through history, through astronomy, and possibly through the most detail in fiction. Specifically, Sarah has watched every episode of several Star Trek series on Netflix, watched all the movies, read dozens of Star Trek books, and otherwise immersed herself in the world of the Starship Enterprise! That’s why, as part of the iHomeschool Network celebration of some noted figures born in March, I’ve chosen to take a look at three of the mainstays of Star Trek: The Original Series – William Shatner (Captain James T. Kirk); Leonary Nimoy (Science Officer Mr. Spock); and James Doohan (Chief Engineer Montgomery Scott, aka “Scotty”). 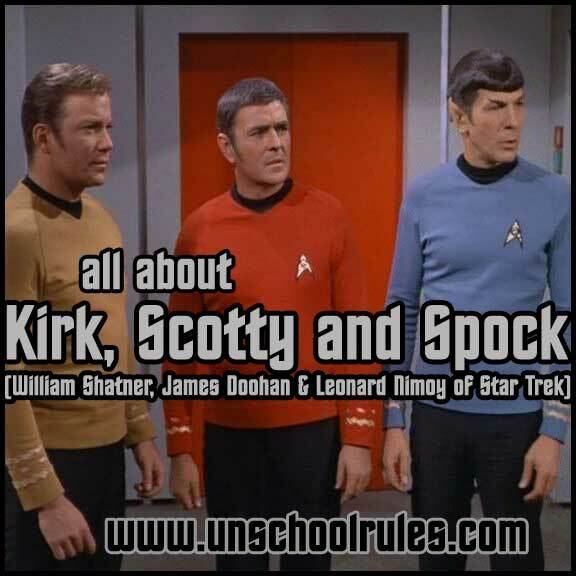 This month, instead of going into great detail on all three of these gentlemen, I’m going to share a few fun facts about their lives, and then direct you to some amazing resources for homeschooling with Star Trek that do a much more thorough job than I could possibly do! William Shatner, who was born March 22, 1931, celebrates his 83rd birthday this year. Shatner is actually Canadian – born in Montreal, Quebec. He’s been acting since the 1950s – and all of the Star Trek actors filmed their episodes from 1966 to 1969, more than 20 years before I was watching it on reruns and more than 40 years (!!) before Sarah dug into Star Trek on Netflix! You can read more about Shatner on Wikipedia, on his website and on his IMDB page. After Star Trek, he continued to act in a variety of roles, and both starred in many of the Star Trek movies, and directed one of the most popular ones, Star Trek IV: The Voyage Home. Unknown to me until Sarah took an interest in him, Nimoy also directed Three Men and a Baby! His varied career also includes the release of several records, his skill as a private pilot, his original training as a photographer, and two autobiographies, I Am Not Spock and I Am Spock. One of the things I love most is hearing that he and Shatner really are lifelong friends, especially since their TV and movie friendship is one of the most awesome things I’ve ever seen. You can read more about Nimoy on Wikipedia, at his photography website and on IMDB. Like Shatner, Doohan was born in Canada, and in fact served in the Royal Canadian Artillery during World War II, and was shot six times storming Juno Beach on D-Day. (Unfortunately, he was shot by a fellow Canadian!) He survived, but his right middle finger was amputated, which he concealed all during his acting career. Though his noted “Scottish” accent as Scotty is perhaps one of the most famous of all time, Doohan actually had a talent for many accents and went over them with creator Gene Roddenberry to find the right one for the part. Interestingly, for a long time, Doohan did not get along well with Shatner in real life, even being quoted as saying “I like Captain Kirk, but I can’t say that I’m very fond of Bill.” Before his death, though, the two did appear together on more amiable terms. You can read more about Doohan on Wikipedia and on his IMDB page. And, of course, you can hear some of his most famous lines here! Now this is what it’s all about, for our family. We love to learn through books and movies, and we don’t really differentiate between “educational” movies and books and “noneducational” ones. On Layered Soul: Stacey wrote about Leonard Nimoy as part of last year’s birthday celebration in a fascinating take combining art and science, Poetry, Photography, and Leonard Nimoy. If you’re interested, there are many more cool “March birthday” lessons from my fellow iHomeschool Network bloggers. Click the image below to check them out! And thanks for stopping by to help me wish William Shatner, Leonard Nimoy and James Doohan a happy birthday in thanks for all the fun they (and Star Trek) bring our family! This entry is about famous birthdays, movies, technology, unit study, unschooling. The previous post was A birthday celebration: Learning about Abraham Lincoln. The next post is A birthday celebration: Leonardo Da Vinci, art and invention. I think I might need to make a birthday celebrations board or something on pinterest, so I can file all of these away for future use. I’m so excited to have found your blog (it was recommended by another blogger). We also live in PA (eastern), and after five years of homeschooling we began unschooling a few months ago. I’m looking forward to perusing your posts because I’m still unsure as to how this is going to pan out in such a highly regulated state. Nice to meet you!! I have had no problems so far – and I’m actually working on a huge post coming in a couple weeks that goes into depth on how we meet the rules that PA sets and still do what we love! Thank the Lord, that post will be an answer to my prayers! I actually just wrote a post ranting about PA homeschool laws because I’ve worked myself up so much about it. I can’t wait to read what you have to say! Thanks again!